Arrow sets the stage for the season finale when the next phase of Adrian Chase’s plan is set in motion and Oliver struggles to counter it. One of the most frustrating tropes in modern genre storytelling is the villain being caught because it’s part of their plan. It can be clever when executed correctly but it is completely overused and makes the capture of the villain lose its impact since it’s often clear that this is exactly what’s happening. Oliver supposedly defeated Chase last week when he completely devalued his motivation by revealing to him that his father wanted to disown him. It was a solid way for Oliver to get the upper hand for a change and seemed to change up the dynamic between them somewhat. Chase having a backup plan in case he’s captured makes sense for him given his obsessive attitude to planning but it’d be more realistic to have things that he hadn’t thought of. I do think that he didn’t know what his father truly thought of him but it should be making more of an impact on him than it seems to. Chase going after the team rather than Oliver directly makes a lot of sense. It has been identified that the team makes Oliver stronger and pushes him to be a better person so the logical way to really get to him is remove that strength. Oliver becomes more distracted and strung out as every member of the team is systematically captured. It’s a clear progression and furthers the idea that Oliver is less effective without his friends and family around him. An offer is extended to Oliver. The team will be let go if he lets Chase go. For a while Oliver is convinced that he can find a way to rescue the team without giving into Chase’s demand but as the episode progresses it becomes clear that this won’t work. It takes a long time for Oliver to admit it but he is slowly brought to the point where he has no other choice. There is almost has a passive quality to this episode. There are things going on but the focus is more on how Oliver reacts to the situation rather than progressing story. It’s the right move for the penultimate episode as it outlines what the stakes will be for next week on an emotional level. The staging of this season’s conflict is really refreshing as it takes us away from the city under siege plot that has defined every other finale this show has had. It’s a very personal battle that Oliver has to fight and putting his team at stake makes the situation feel more urgent than an army attacking the city. I found Oliver’s conversation with Chase in his cell to be really interesting even if it was a little too reminiscent of a similar scenario depicted in The Dark Knight. Oliver tries to use force to get what he wants which shows that he is starting to become unhinged. Intellectually he knows that Chase won’t respond to force but the frustration he feels at getting nowhere in the search for his friends doesn’t have another outlet. Chase knows that he has Oliver right where he wants him and he knows that it’s only a matter of time before Oliver does exactly what he wants. It’s a good scene as it highlights the complexity in Oliver’s conflict with Chase but also allows him to reclaim some composure when he refuses to kill him. Their conversation repeats Chase’s theory that Oliver is one more loss away from being completely destroyed. This has been brought up a number of times so I wonder if there will be some pay off to that in the form of an unexpected character death next week. Malcolm Merlyn returns once he hears that Thea is in danger out of his warped desire to protect her. This makes for a great team-up as Malcolm and Oliver compliment each other so well. Malcolm understands Oliver on a primal level as shown by the way he relates to Oliver’s emotions once it is revealed to him that Chase has captured William. They will definitely work well together until the crisis is over judging by what we know of their history. Their bickering is enjoyable to watch and they are certainly effective in whatever they try to do. His presence is important as the show is essentially going to come full circle next week when the flashbacks finish forever so having a reminder or characters and events from back in season 1 adds a sense of symmetry to everything. His presence also allows Oliver to start building a temporary team to bring down Chase. At the moment Chase has Black Siren, Evelyn and Talia -along with her legion of Ninjas- working with him which puts him at an advantage numbers wise. This season has been all about teamwork and relying on others so Oliver needs to recruit a temporary team to save his permanent team. Malcolm is the first member before Oliver reaches out to Nyssa who has some unresolved issues with her sister that can only probably be dealt with using a well choreographed sword fight. To even the odds he hopes to recruit Slade Wilson who is sitting in his Lian Yu cell looking menacing. I can’t think of a more awesome guest team than those three names. 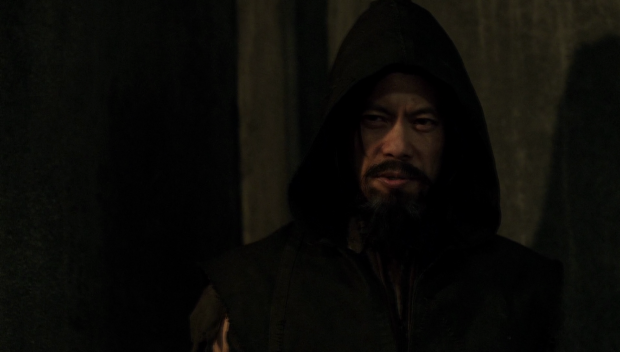 Seeing Slade again was the ideal beat to end the episode on as it lease on a bit of a mystery as to whether Slade can be trusted or even if he will agree to it. I suspect he’ll agree but can’t quite be trusted though it might be interesting to see Oliver and Slade come to some sort of truce. Since he’s one of the few people alive who knew Oliver on the island it could be fitting to see them part as something other than enemies. Black Siren’s role in the episode was perfectly handled. Her motivation for working with Chase makes sense. He promises her freedom in return for her help so she feels that it’s a no brainer. Tasking her with capturing Quentin and Thea might be a cruel joke on Chase’s part as he will be aware of what seeing her will represent to Quentin. His reaction is excellent and Paul Blackthorne completely nails the range of emotions. At first he’s positive that he has his Laurel back despite Thea’s explanation informing him of her origins. He does realise this eventually but it takes a while for him to process it which makes sense for a man who broadly accepts the facts in front of him. As far as he’s concerned he sees Laurel in the flesh so it might be his Laurel. Katie Cassidy also does a great job giving Black Siren some depth. She isn’t really comfortable being involved in the capture of a man who looks exactly like her father but she does it anyway because she promised. It’s a quick character beat but it tells us so much about her and with the recent announcement that Katie Cassidy will be rejoining the cast next season there’s a lot of room for development there. The episode also manages to deliver a couple of low key moments. Throwing Oliver a birthday party is a really good way to show how much the team have bonded over the course of the season. 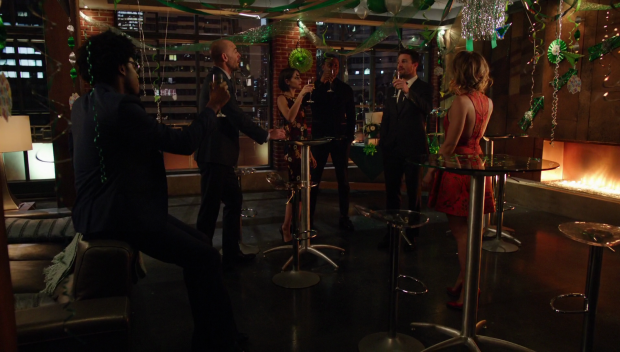 It’s refreshing to see the characters spend some time together without a threat looming over them and Oliver’s reaction to the surprise was hilarious. Of course he’d assume that someone was attacking him. The reference to the team usually being busy saving the city at that time of year was a nice touch especially since that isn’t what they’re doing this year.I won’t say much about the suggestion that Oliver and Felicity might get back together because that isn’t interesting to me but I can’t fault the episode for low key character moments. 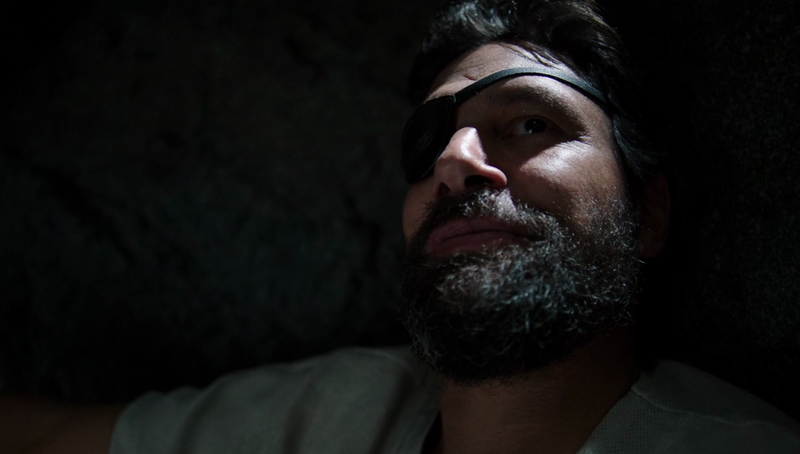 We only have one more week of flashbacks after this episode and it seems that Oliver is being put through a massive trial to win his freedom from the island. Having Kovar back caps off the Russian arc nicely and gives him a formidable opponent to overcome before rejoining civilisation. The drug induced torture is well done as it allows faces from the past to come back. He is visited by a hallucination of Yao Fe reminds Oliver and the audience of how his journey started as well as helping him contextualise all the pain and loss caused by the island. Ultimately this will fuel his season 1 mission so it’s important to address that again. Laurel appearing to him as the voice of reason that breaks him out of his drug induced haze was really effective as it reminds him that he has to keep fighting to protect those he cares about. Hopefully there will be a satisfying showdown with Kovar next week. A solid episode that does a bit of place setting for the finale but does so in an effective way. Chase being essentially invincible and wanting to be caught is a bit overplayed in genre fiction but it works well enough here. Seeing Oliver gradually unravel as more of his team disappear is well acted and keeps a constant through line in the episode. The best scene was when Oliver confronted Chase and used violence to try and make him talk. It was never going to work but Oliver is so frustrated that he no longer cares. He does regain some composure when refusing to kill him. Malcolm Merlyn’s return is great. The dynamic between them has always been a lot of fun and that continues here. After all they’ve experienced there’s an understanding between them and Malcolm’s appearance is consistent with his desire to protect Thea. Oliver recruiting Nyssa and later Slade to act as his temporary team is really exciting as well. 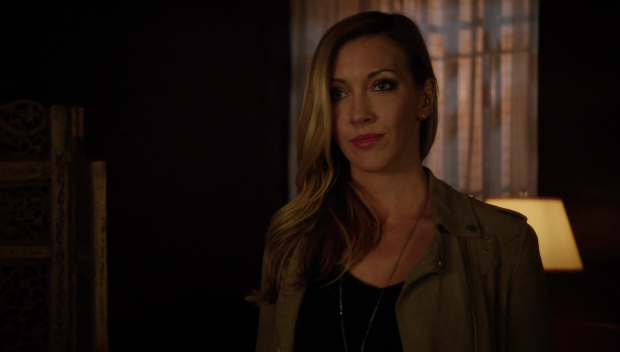 Black Siren’s return is perfectly handled with Quentin’s reaction feeling natural and even some depth given to Black Siren thanks to the writing and Katie Cassidy’s performance. Low key moments such as Oliver’s birthday party show us how much the team have bonded over the season. The flashbacks look to be coming to a conclusive end after next week. Yao Fe appearing to Oliver during his drug induced torture helps contextualise the loss that fuels his season 1 mission and Laurel reminding him to keep fighting was the right way for him to come out of it. Hopefully there will be a satisfying conclusion to this next week.